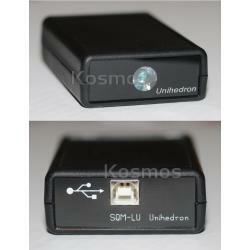 Sky Quality Meter - LU, Kosmos Scientific de México, S.A. de C.V.
An USB SQM model for night-time sky brightness monitoring!. The "Sky Quality Meter" measures the brightness of the night sky in magnitudes per square arcsecond. Unprecedented sensitivity in a handheld meter! - Find out how good the night or site REALLY is. - Compare the sky brightness at different sites quantitatively. - Document the evolution of light pollution in your area. - Set planetarium dome illumination to mimic the skies people are likely to experience elsewhere in the city. - Monitor sky brightness through the night, night-to-night, and year-to-year. - Determine which nights show the greatest promise for finding the 'faintest fuzzies'! - Calibrate the effect of sky brightness on qualitative measures such as the Bortle Scale. - Investigate how sky brightness correlates with the solar cycle and month-to-month sunspot activity. - Help provide local ground truth for future sky brightness prediction with the Clear Sky Clock. - CCD users can make a correlation between the SQM reading and when the background reaches some ADC level. - Audible signal while measurement is in progress. - Sky brightness displayed in visual magnitudes per square arcsecond. - Infrared blocking filter restricts measurement to visual bandpass. - Temperature in both Celsius and Fahrenheit as well as model number and serial number can be displayed with different button press sequence. - Precision readings at even the darkest sites. - Power-saving features designed in for maximum battery life.